Notwithstanding the claims and counterclaims of different political parties about riding the crest of a popularity wave in Uttar Pradesh, Tuesday’s results of the three bypoll seats out of 403 state assembly seats have sprung surprises for all key political players. 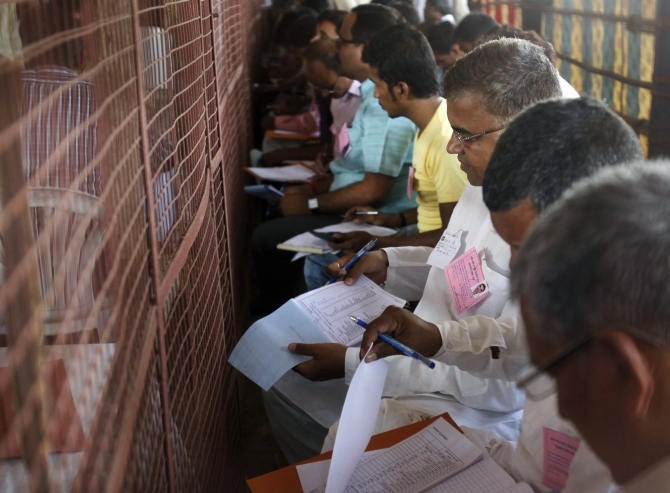 In Uttar Pradesh, by-elections were held in Muzaffarnagar, Bikapur and Deoband assembly constituencies. The Bharatiya Janata Party, which virtually swept India’s most populous state in May 2014, managed to win the Muzaffarnagar seat while the ruling Samajwadi Party could retain only one of the three seats which were in its kitty. Muzaffarnagar, where the politics of communal polarisation stood at its peak, saw BJP’s Kapil Dev Agarwal winning with 65,378 votes, leaving SP’s Gaurav Swaroop behind by a margin of 7,352 votes. Rashtriya Lok Dal’s Girish Pal managed to get 14,673 votes at the third position while Congress's Salman Saeed trailed with 10,561 votes. The bypoll results are being viewed as crucial in the countdown to the assembly polls in Uttar Pradesh next year. The BJP, which continues to harp on building the much hyped Ram temple, lost to Samajwadi Party in Bikapur, which lies next door to Ayodhya. The seat was bagged by SP’s Anand Sen, who got 68,896 votes. It was the death of his father Mitrasen Yadav, a popular veteran politician from the area, which led to the bypoll. Munna Singh Chauhan, the nominee of the RLD, which is largely based in western UP, managed to take the second place with 62,456 votes. Significantly, All India Majlis-e-Ittehadul Muslimeen leader Asauddin Owaisi who had fielded his candidate in Bikapur, managed to bag 11,857 votes, barely 76 votes less than the BJP candidate who got 11,933 votes. But what came as the biggest surprise for all and sundry was the Congress win in Deoband, the place of India’s leading school of Islamic thought. Congress candidate Mavia Ali (51,012 votes) defeated his closest rival of the BJP (Ram Pal Singh Pundir) by a margin of 4,499 votes. The results have exposed the claim of Samajwadi Party Chief Mulayam Singh Yadav that his party’s victory at the recently concluded panchayat elections was a reflection of the mood of the people. Political pundits see the panchayat win as an outcome of the heavy play of money and muscle power. “It is this by-election that shows the mood of the people who cannot be guided or compelled to go behind any political party like dumb driven cattle”, asserts Ashutosh Misra, professor and head of the department of political science at Lucknow University. “See the true colour of democracy -- each seat has gone to a different party, leaving not only the losers but also the winners totally surprised”, he added. What fell from the sky in Tamil Nadu? Boxing champ Pacquiao creates a storm, says gays 'worse than animals'!